I bought these to keep in my changing bag so I can whip something out quickly before my daughters lunch is ready (she gets hangry!) She loves them, I've not tasted them myself but they go down a treat! When my daugther was 6months old and i introduces this she became so addicted to it. So far I had recommended to a number of my friends and family and their kids absolutely love it. For these reasons i highly recommend this product to anyone out there wanting to give a try. These snacks are something easy for you to grab and go! They come in variety of flavours, although then would be my first choice for a snack, my little one L O V E D them! Great product and would use again!! Really tasty snack for children,melt fast and taste really good.my baby loves it. Ella’s kitchen has the best finger food. My 7 month old daughter absolutely loves these. They are a great size for little fingers to hold and a mild flavour so they are not too overpowering. You get a good quantity for the price and the packet is resealable. The only problem I had with these were that they became quite sticky once they have been chewed on, and will stick to clothes and anything my baby touches, but nothing a wipe can’t clean up! 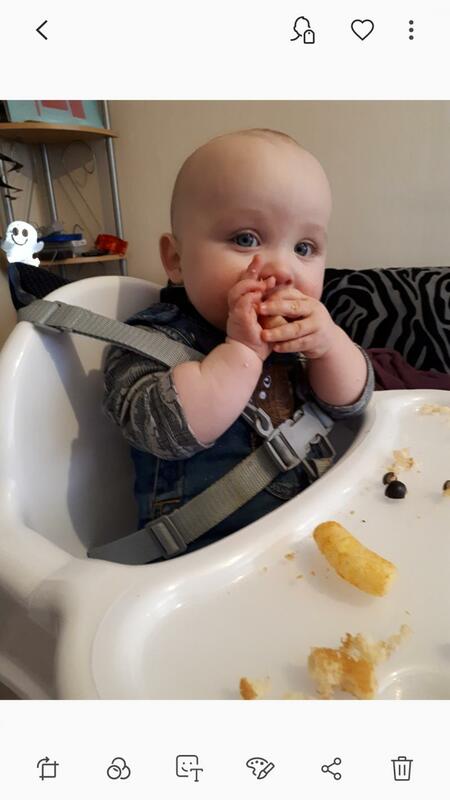 Overal a fantastic first finger food for your baby. I give them to my daughter as a snack and I think they’re so easy to give, especially on the go. She loves them as she can hold them easily and eat them. 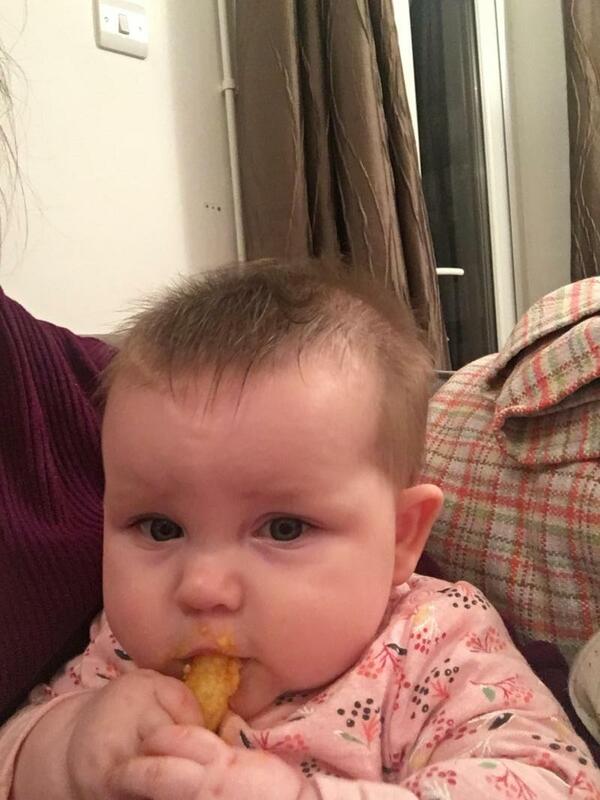 They’re like giant wotsits but with a fruity flavour, good for getting babies started by eating themselves. Quick and easy treat (distraction) when out and about. Fun and healthy snack. Great packaging. Wipes are a necessity for the aftermath of teeny tiny crumbs that go everywhere. 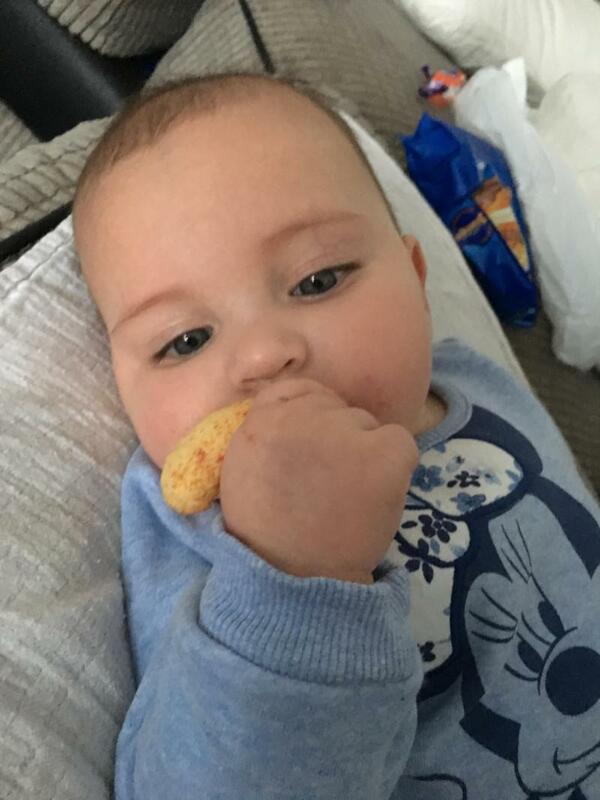 These are a firm favourite snack for our little girl when out and about , great satisfying snack that helps distract a grumpy hungry toddler or simply as a snack to prevent hunger mood swings. Lovely packaging that's good size for either our toddler to hold herself or to be passed a couple at a time as good chunky hand size treats. Big thumbs up from us for these. My little boy love these and there ideal for snacks whilst shopping etc. Can be quite messy but easy to clean and doesn't stain. These are great my daughter loves them as an alternative to savoury crisps. Help baby to get used to different textures and tastes. Easy to hold and eat, even without teeth yet. My little one absolutely loves these. Due to him not talking yet all I here is the word "more" once he has finished a couple. Nice size for the grip and unusual flavour. Taste good and happy with the nutritional value compared to others on the market. My son absolutely loves these! 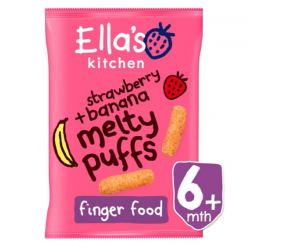 The whole Ella’s Kitchens puff range he devoured! They are a snack that babies love! They are easy to take out with you, nutritional and great for weaning. They melt in your Baby’s mouth which I loved in the early weaning stage when Milo was learning to chew and swallow. The only downfall is that they are expensive to buy. I try and buy them when they are on offer. These are 100% your must have baby/toddler snack! This product is a favourite in our house. It’s like sweet and savoury all at once and my baby girl loves them. Easy to hold and fun to have. Baby loves them and they melt quick which is good when you have a baby like mine who loves to shove as much in as possible. Light and tasty for her. Brilliant for confidence building in parents. They melt in babies mouth so hard to choke on them. Good flavour. Can be really messy as they get super soggy. these are great for on the go with little ones when out and about. There is a good range of different flavours aswell. They are nice and light so heavy on the baby's stomach. My LG refused all food until I tried these. She absolutely loves them and gets really excited when I bring the bag out. The size of the puffs are perfect for her hands, and have improved her hand eye coordination. These were both of my children's favourite snack at an infants age. These satisfied them both it seemed with flavour and keeping them full for a longer time apposed to veggie sticks etc. Made in the child's best interests I would recommend 100% to others the stranger the flavours the better they seem to satisfy. These are amazing. 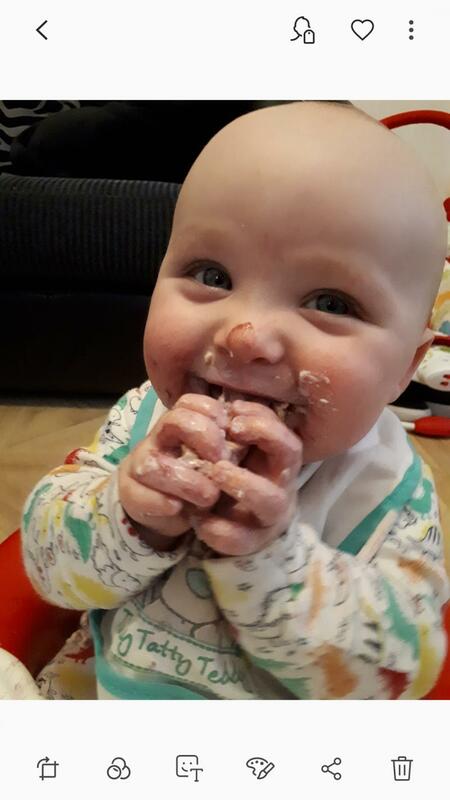 My 9 month old would eat them every single meal if I let him! He loves these ones as a little sweet treat. They're very quickly gobbled up! 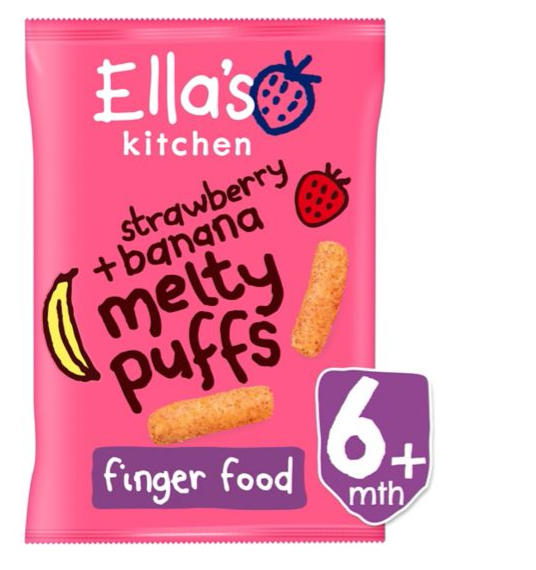 Ella's Kitchen Grab Me Melty Puffs Strawberries + Bananas 7m+ make for a great snack. Made with 100% organic strawberry and banana flavoured maize.